Thousands of pre-war tourists travelled to Italy to see Naples' Magnificent Harbor and Mt. Vesuvius. 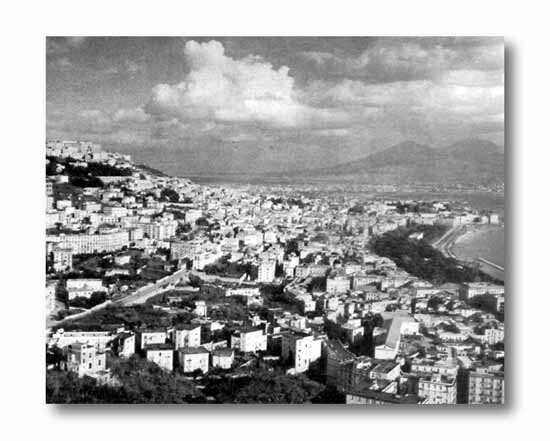 Naples, Italy's principal port and third largest city, was the first important objective of the Allied invasion. After reconstruction, its harbor was necessary to an adequate flow of supplies to the men at the fighting front. 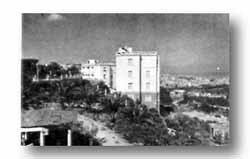 Subjected to Allied bombing and shelling during the entire previous summer, Naples became vulnerable to the German Luftwaffe shortly after its liberation. Enemy attacks on the harbor continued throughout the following year. The soldiers and uniforms of all the United Nations could be seen any day on a walk up Via Roma, for Naples was the main gateway to the Italian Theater. The Red Cross club and San Carlo opera were big attractions. IN MORE SECLUDED SECTIONS of the city, white-baked Mediterranean villas escaped effects of intensive bombing and shelling. NARROW STREETS, battered buildings, and ragged natives, however, were a much more common sight.